Railpictures.ca - Doug Page Photo: Once again, the trip to the Stuart Street diesel shop has been fruitful. On this morning in December 1994, I caught SD40-2Ws 5362 and 5314 in the short-lived “CN North America” paint scheme (phased out when CN privatized), a pair of SW1200RS’ (7307 behind the SDs, and 1388 wearing the “switcher” version of the CN North America scheme), an unidentified “SWeep”, GP9RM 4110 and another GP9 rebuild, and a van. | Railpictures.ca – Canadian Railway Photography – photographie ferroviaire Canadienne. Caption: Once again, the trip to the Stuart Street diesel shop has been fruitful. 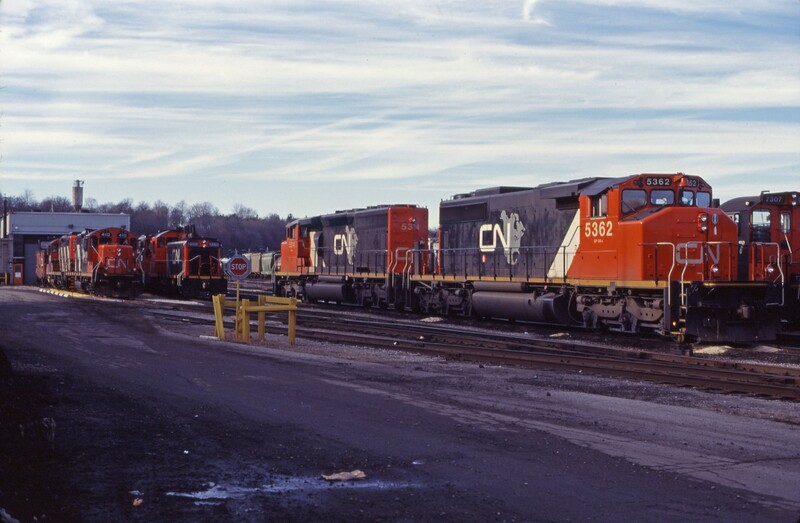 On this morning in December 1994, I caught SD40-2Ws 5362 and 5314 in the short-lived "CN North America" paint scheme (phased out when CN privatized), a pair of SW1200RS' (7307 behind the SDs, and 1388 wearing the "switcher" version of the CN North America scheme), an unidentified "SWeep", GP9RM 4110 and another GP9 rebuild, and a van.